"These chicken nuggets are tender and delicious! Many friends have asked for the recipe and my husband loves them!" Trim any fat from chicken and cut into 1-inch cubes. In a bowl, beat the eggs with the water and add the chicken. Combine the parsley, thyme, red pepper, bread crumbs, wheat germ, basil and pepper. Stir in the oil with a fork and mix well to distribute evenly. Pour seasoning mixture into a resealable plastic bag and toss the chicken pieces to coat. Place coated chicken pieces on the prepared baking sheet and bake at 425 degrees F (220 degrees C) for 10 minutes, turn the pieces, and bake for an additional 5 minutes. 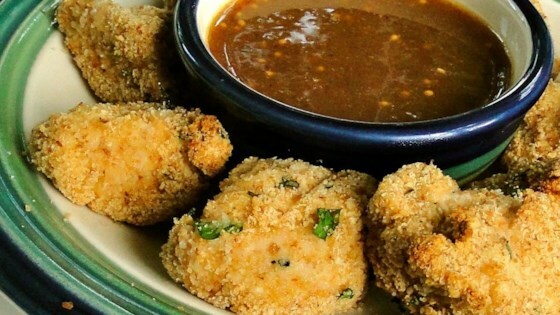 See how to make tender baked chicken nuggets with an herb breading. Added 2 tbsp of parmesan and 2/3 c of bread crumbs instead of adding the wheat germ. Fantastic!! really good and tasty. I used olive oil instead of veggie oil, though, which made it even tastier! Thanks, Amy!